Free Hospitality Assessment — Get a friend to visit. Many churches have special events with the idea of “invite a friend” or to open up their church to the neighborhood. Churches put on Christmas cantatas, Easter services, special services for Lenten series, or a variety of other means. 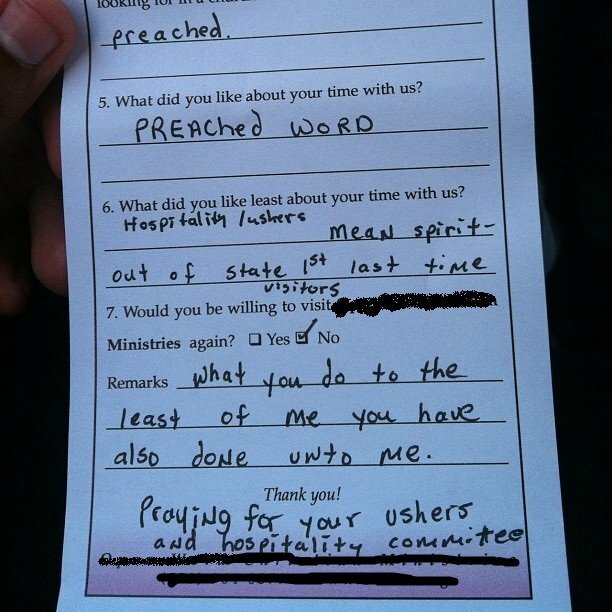 Allow them to give you honest feedback on how friendly your church really is. This person must be a first time visitor, unknown to everybody in your congregation. Allow their experience to speak for itself. Was it easy to find classrooms, restrooms, a seat, etc.? Was the facility attractive and inviting? 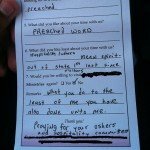 Who did it feel like the church was for? What did the signs, printed materials say about the church? Was the service easy to follow? Did they feel included or like an outsider? If they had desired to make a commitment, get more information or seek prayer, were they able to find it? Most of all, did they feel a spiritual connection? Of course, it is God who will draw visitors and members to your church, but make sure that your church doesn’t have any “stumbling blocks,” that stand in the way of someone becoming a part of your church family. Something as small as, “I couldn’t find a parking space,” or “No one shook my hand,” could keep someone from taking the next step of commitment to God and your church.